Once the references are ready, you need to set the scene length by adding the right number of frames to your scene. You can set the global scene length from the top menu. In the Xsheet and Timeline view, you can add and remove frames from a scene to edit its length. 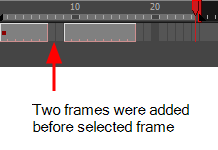 When you remove frames at the end of a scene to reduce the scene length in the Timeline view, the exposed drawings and symbols are not deleted. They're still available if you extend the scene afterward. ‣ Right: To add more frames to your scene. ‣ Left: To reduce the number of frames in your scene. You can add frames anywhere in the middle of the scene—before or after a selection. If you select a frame row in the Xsheet view, Harmony will add the new frames before or after the selection, depending on your choice. ‣ In the Timeline view, select the frame to which you want to add frames before or after. ‣ In the Xsheet view, select a frame row. ‣ From the top menu, select Scene > Frame > Add Frames Before Selection or Add Frames After Selection. ‣ In the Xsheet view, right-click and select Frames > Add Frames Before Selection or Add Frames After Selection. ‣ In the Xsheet toolbar, click the Add Frames button to add frame after your selection. ‣ Press Ctrl + G and Ctrl + H (Windows/Linux) or ⌘ + G and Ctrl + H (Mac OS X). In the Number of Frames to Add field, enter the number of frames needed in the scene. In the top menu, select Scene > Frames > Add Frames at Start or Add Frames at End. 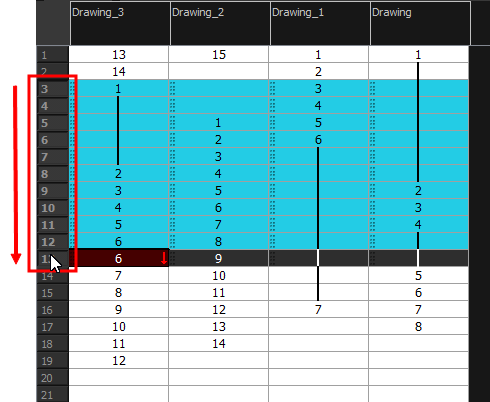 ‣ Select a frame in a given column. ‣ Select a frame range by clicking the first frame’s number and then dragging the selection highlight down to the last frame to delete. ‣ From the top menu, select Scene > Frame > Remove Selected Frames. ‣ Press Delete to delete the selection. ‣ Click the Remove Frames button. To remove several frame selections, click the button repeatedly. ‣ Click Yes to delete the selection. ‣ Click No to delete only the exposure in the cell and not the frames. ‣ Select the Don’t Show This Message Again option to prevent the warning message from being displayed each time you delete a frame range.